Kenny Shiels reckons John Caulfield is playing mind-games following his comments about the Brandywell's 3G surface as Cork City clash with Derry City tonight. 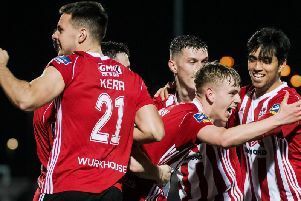 KENNY SHIELS has accused John Caulfield of being ‘insecure’ following the Cork City manager’s claims Brandywell Stadium’s artificial pitch hands Derry City an unfair advantage. Caulfield believes City’s ‘all-weather’ pitch, and the similar surface at Oriel Park, has favourably influenced results for both Derry and Dundalk. And while Shiels agrees with Caulfield’s comments, the City boss believes it’s simply a ploy to take the pressure off his players and prepare an excuse ahead of tonight’s top of the table clash. “I think he’s right to make those comments,” said Shiels. “It’s maybe an insecurity and what he’s trying to do is take the pressure off his team and off his players so that if they were to win it makes them look better - that’s all that is. “I’ve seen that trick before. I’ve done it myself as well so I know where he’s coming from. We’ve got a different level of intelligence here so we can read that very, very easily. I think he's preparing an excuse." Caulfield is expecting ‘a different type of game’ due to the playing surface and the Rebels have trained on synthetic pitches all week in preparation. Shiels is hoping Cork can play with “style” tonight and doesn’t believe the pitch will harm the game as a spectacle. Cork have already lost to Dundalk, Waterford and Shamrock Rovers, so does Shiels believe they are as formidable a side as they were last season? Shiels could be without midfielder, Nicky Low and experienced defender, Gavin Peers who are both rated doubtful for the game.